Statue of Liberty for educators Franco-American Liberty! Click here for your Proud to be Franco-American button! See the Cross Listing of Web Sites who list FAWI as a resource! More info for you! A discussion of women and their pertinent issues in the French and Indian (Seven Years) War era. We interpret the daily lives of women in Nouvelle France [roughly 1740-1760]. Please share with us information about the cultures of this period. Peruse our files, photos, and links. Explore with us la difference! For the first time in 2005, The War That Made America will tell the remarkable stories of The French and Indian War. As the French and English clashed to control North America, Native Americans manipulated the balance of power. It also marks the inauspicious beginning of George Washington's military career. Presented by WQED Multimedia, Pittsburgh and The French and Indian War 250 Inc., the four-hour TV series, educational outreach activities, companion book, and Web site are at the center of a national initiative to mark the 250th commemoration of this critical moment in American history. In addition to the four-hour broadcast series, tentatively planned to premiere in Fall 2005, The War That Made America is a comprehensive Multimedia project that includes a companion book, Web site, innovative curriculum components for middle school and high school that will offer new insights as well as new strategies for teaching, and an extensive outreach campaign designed to engage the public in a fuller understanding of this important chapter in American History. L'époque (1758-61), riche en bouleversements, est à cheval entre l'effondrement de la Nouvelle-France et l'instauration du régime anglais. C'est <<un temps de toutes les passions>>. Inspirée de faits réels, l'histoire des amours tragiques d'une jeune paysanne du Bas Saint-Laurent et d'un audacieux aventurier se déroule ici à la manière d'une destinée inéluctable, en miroir d'une autre Histoire déjà écrite, celle de l'abandon du Canada par la France. Set against a sweeping historical fresque, the epic tale of a great love story thwarted by fortune and men's will. 1758-61: a turbulent period bridging the collapse of New France and the establishment of the British regime. An "era of passions". This tragic love story of a young peasant girl from the lower Saint Laurent River and a dashing adventurer is based on fact. As their passionate destiny advances inexorably, driven by fate, it mirrors another story that's already been written: France's abandon of Canada. (FWW) Project is a searchable database containing works by French women authors from the 16th to the 20th century. - Maria Chapdelaine: a tale of the Lake St. John Country . 353 Ko. 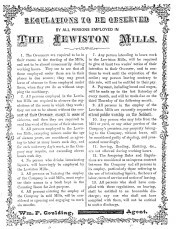 "Les Collections numérisées du Canada"
"Ressources en direct sur le patrimoine canadien"
Lewiston Mills Regulations, Lewiston, Maine, 1867. Courtesy of the American Textile History Museum, Lowell, Mass. A blog about food, community, the environment, and living in place. Reprint by Françoise Paradis, Ed.D. 1998 Maryann Hartman Award Winners including Lucy Poulin of H.O.M.E. The Acadian Landing Site on the banks of the St. John River in Madawaska commemorates the first Acadian settlers in the Saint John Valley. The site is part of the Tante Blanche museum complex, which includes artifact displays, a one-room schoolhouse, and a house built with square-sawn logs more than 100 years ago. The Stigmatized Ecstatic of Woonsocket, R.I.: Marie Rose Ferron - "The Little Rose"
The Stigmatized Ecstatic of Woonsocket, R.I.: Marie Louise Bonier"
Michele Choiniere, "was born into a musical Franco-American family in northern Vermont..."
Chanterelle, "brings the audience into the heart of the New England's warm, lively French culture..."
Rebecca Martin, "Rebecca left her native Rumford Point, Maine, behind and made the big move to New York City..."
Lucie Therrien, "Nationally & internationally acclaimed..."
Josée Vachon, "Born in Quebec and raised in Maine..."
Susan Poulin, ..."selected by Portland Magazine as one of their 10 most intriguing people in Maine..."
"Keep Your Mind and Your Hands Busy:" Expressive Dimensions of the Lone Quilter"
*"tourtiere": kitchen utensil which is used to bake the "tourtes"
*"tourte": a kind of pastry filled with meat, fruits, etc. *"tourterelle":Ê a pigeon, smaller than the ordinary pigeon (In the mid-17th century, in late spring and early fall, hundreds of thousands of these "passenger pigeons" darkened the skies and filled the forests of northeastern North America during their seasonal migrations. Colonists shot and trapped them for their meat, eventually to extinction some time in the 1800's. There are many variations of the Tourtière and a search of the internet will lead to many of these recipes. featuring Franco-American women writers and many others! The FAFEMM-L, 1997-2004, Franco-American Free Exchange Moving into the Millennium is no longer in service. Thank you, merci! For all the support, listeros! LA LISTE NETFEMMES La première, c'est la liste d'envoi NetFemmes@cam.org. NetFemmes, c'est une liste destinée aux chercheuses et militantes féministes francophones, un espace où, comme sur PAR-L, nous pourrons partager nos expériences, nos connaissances, refléchir et collaborer ensemble. Principal outil de concertation du réseau NetFemmes, la liste netfemme@netfemmes.org s'adresse particulièrement aux militantes et aux chercheuses féministes. C'est un espace où les féministes peuvent partager leurs expériences, leurs connaissances, collaborer et réfléchir ensemble.